A pair of Piccadilly Records slipmats including one each of the 'Cityscape' and 'Half Record' designs. 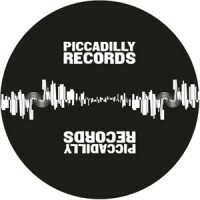 Slipmat 1: Piccadilly Records logo and white 'Cityscape' print on black felt slipmat. Designed by Mark Brown (markbrownstudio.co.uk), the design is a features a graphic image of the Manchester cityscape, which also looks like an electronic waveform created by music. 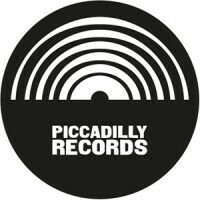 Slipmat 2: Piccadilly Records logo and white 'Half Record' print on black felt slipmat. Designed by Mark Brown (markbrownstudio.co.uk), the design is a features a graphic representation of the Manchester G-MEX Centre combined with half a vinyl record.